Happy New Year to all of my blog followers and newbies just reading about my life stories for the first time, and most importantly to my family and friends. I wanted to take this opportunity to thank my wonderful family and friends for their loving support as I dove into the blogging world this year. It is has been so much fun for me discovering that I love to write and share my thoughts, dreams, and life stuff. I just published my 30th blog post today – New Year’s Eve. Thus meeting my goal for myself for the year. 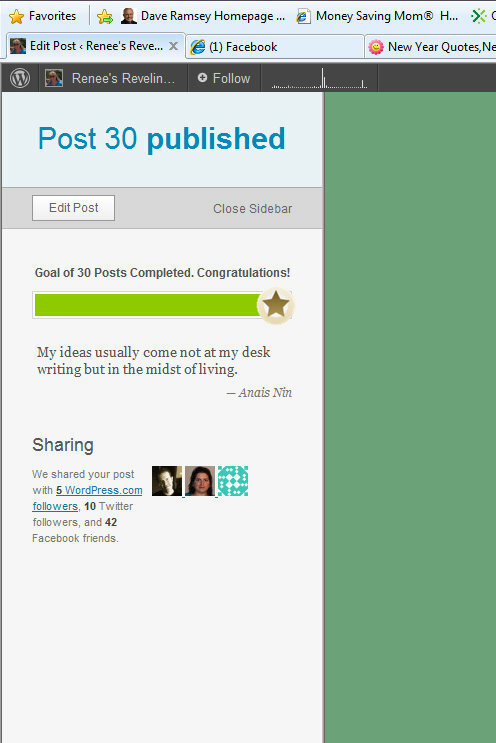 I got a gold star from WordPress (see below). This concludes the gloating portion of my post. I am looking forward to continuing to share my life stories and experiences in the New Year, and putting together new ideas and information to share with everyone. May you enjoy a wonderful New Year’s Eve with whoever you are celebrating with, and to the Super Six – stay safe. We’re so proud of the wonderful woman you are and so happy that you’ve found new and fulfilling avenues in your life.